So What Does This Pot Look Like? Seaside GEMboree is Coming! Start Planning! Is It A Report Or An Article? So You Think You Know All The Answers...! The AFMS Endowment Fund was established to raise funds which can be used for special projects of the AFMS. Only the interest from the fund can be used each year. How do you and your members benefit from the AFMS Endowment Fund? For the past several years each of the Regional Federations have been given at no charge $200 in supplies. These supplies include such things as Rules Books, pins, and patches. The Regional Federations may, in turn, sell these items with the proceeds going directly to the Regional Federation treasury. What supplies are given is left to each Regional Federation. The Endowment Fund interest also pays for duplication of the winning programs from the Program Competition for the Regional Federations to each receive copies at no charge. Many of our clubs throughout the country borrow these programs to use at their club meetings. The principal of the Fund is now over $100,000.00. Unfortunately, although the investments made with these funds are in secure holdings, interest rates have been lowered considerably this year and thus our available funds for the coming year will be somewhat lower. In an effort to help increase our earning power, the AFMS Endowment Fund has held a series of raffles each year with drawings held at the annual convention - this year in Ventura, CA in June. In the last issue we told you about one of the special raffle items we will have. Remember, it's a Dutch Oven especially created as a memento of the Lewis & Clark Exploration Bi-Centennial Celebration which began mid-January in Charlottesville, VA. Because of the weight of the oven you will either have to be in Ventura to pick it up in person or make arrangements to pay the shipping for it to be sent to your home. The oven really is a lovely item and could easily be used in your home either as a display item or for actual cooking in your kitchen or fireplace. We're also gaining several additional donations which we'll tell you more about in the coming months. These include a lovely turquoise necklace, an intarsia and some faceted stones which we hope to have set as gold pendants. Watch these pages for more information about the items and an opportunity to purchase raffle tickets for a chance to win one or more of them. Should you wish to make a monetary donation to the AFMS Endowment Fund, send your check directly to AFMS Treasurer Toby Cozens at the address shown on page 2 of this issue. All contributions will be acknowledged. I hope everyone had happy holidays and is ready for 2003. I am looking forward to working with everyone and hope to see many of you at shows. I will do my best to go to as many shows all over the country as my schedule permits, considering I am not yet retired, but I'm able to do so whenever I want. Maybe that is part of what keeps me going. The problem is that since most of the shows occur on weekends and there are only so many weekends in the year, and there are many more shows than there are available weekends, some multiple shows on the same weekends must occur. Each federation has a show coordinator responsible for coordinating club shows within that federation, and the AFMS has a coordinator whose job is to see that the various federation shows don't conflict with each other. Anyone with access to the Internet can also find information on the various federation shows as well as the AFMS show. Our webmaster does a good job keeping and posting information about the various federations on the web site; however, the information is only as good as what is given to the webmaster. We must keep any posted information under strict control, so only one place will be able to post information on our site. That is the best way to ensure that any information posted is accurate and no unauthorized persons have altered it. 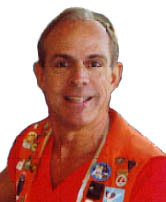 If you don't already know, the address of our website is http://www.amfed.org and the webmaster is Marty Hart. You can send E-mail to him directly from the website by clicking on the label that says "send mail to webmaster@amfed.org". Incidentally, there is also one that sends mail to me at president@amfed.org, and I am pleased to see that several persons have used it to send notes to me. If you have any difficulties or notice any errors with the site, let Marty know. He does a good job, but occasionally things may slip by anyone and I'm sure he would like to know if there are any problems so he can make corrections. Incidentally, if you are wondering how come the AFMS doesn't have the website name www.afms.org, I checked and found that it had already been taken by another organization. My thanks to Marty for all his past work and willingness to continue with the website. If you submit any items to him for posting, be sure to check that all information is correct. That way his job will be all the easier. Happy New Year, everyone! I hope everyone enjoys 2003. Now that the Christmas festivities are over, it is time to start thinking about the Federation and its activities. I guess my first thought was "Just what does the President-elect have to do?" So I dug in my brief case and found the revised Bylaws and Operating Procedures that were so graciously updated this last year. I didn't have any trouble finding in BIG/BOLD print what the duties were! The first thing that popped out, was preparing the budget for 2004. My responsibility, along with the President and Treasurer is to come up with a proposed budget. Obviously, the only way I can do that is if you, the Committee chairs, send me your information. The fact that the convention is in early June this year means that in order to meet the provisions of the O.P., I have to have the budget completed by April 1st. We really don't have all that much time, do we? Along with Federation and rock club business, Kitty and my thoughts are zeroing in on getting out of this cold and snowy weather here in Michigan and are heading for Arizona and New Mexico. As I write this we're watching a new snowstorm which has left 12" of new snow on the ground and has thus delayed our departure by a few days. Please send your mail to me at 81 Palms RV Resort, 2800 West Pine Street, Deming, NM 88030. I can also be reached by e-mail...<normhanschu@prodigy.net> or by cell phone at 269-352-1591. We will be in Quartzsite the first couple weeks of February, and then back to Tucson in time for the opening day of the club show at the Convention Center. While there we will be camped at the pima County Fairgrounds near Tucson...$12.50 a night with full hookups! See you in Quartzsite and/or Tucson. Last month, I proposed we initiate a merit badge system for junior members in order to accomplish two goals at the same time: 1) give junior leaders at local clubs a variety of proven, organized activities that could fill a year, and 2) provide motivation for pebble pups to work toward earning a tangible reward while learning a satisfying skill or knowledge. Over the coming months, I'll describe different badges we might consider and suggest activities that might be done to earn a particular badge. I welcome your comments about the activities I describe as well as thoughts of your own about other activities to consider as I work to put together a formal proposal for this whole concept. To start, let's begin with the basics: a merit badge for Mineral Identification. To earn this, kids would need to achieve two goals: learn the basic rock types and demonstrate how to identify individual minerals. Kids would be expected to explain the differences among the three basic rock types and to identify examples of each: 1) igneous (formed by crystallization of a magma or lava; examples: basalt, granite, obsidian, pumice, scoria); 2) sedimentary (formed by sediments such as gravel, sand, mud, ash, etc., created by the action of wind, water, or ice breaking down older rocks or by minerals precipitating out of water; examples: shale, sandstone, conglomerate, limestone, gypsum); and 3) metamorphic (changed by heat and/or pressure; examples: gneiss, slate, quartzite, marble, schist). Kids should learn to identify several common minerals using a few simple tests of physical properties: color, streak, luster, crystal shape, cleavage, fracture, and hardness. While color is a good indicator for some minerals (such as green malachite), it can be misleading for others (quartz may be clear, white, black, pink, purple, orange, etc.). Streak, or the color left when a mineral is scratched on a white tile plate, can surprise you, as when gray hematite leaves a red streak. The way a mineral reflects light is its luster, and this may be metallic (pyrite), glassy (quartz), waxy (jade), etc. The form of a mineral's crystal, or shape, is another characteristic that helps organize different families of minerals, with quartz being hexagonal, fluorite being octahedral, etc. Cleavage is the tendency of some minerals to split or break along characteristic planes corresponding to directions of minimum cohesion and can give minerals such as mica or calcite distinctive shapes. Fracture is the manner in which a rock or mineral breaks, be it conchoidal, uneven, fibrous, etc. Finally, hardness is the resistance of a mineral to scratching, and the Mohs' scale is a measure of this property that compares the hardness of ten minerals from softest (a rating of 1 for talc) to hardest (a rating of 10 for diamond). Buy a book or pick one up at the library, such as Zim and Shaffer's classic Rocks and Minerals: A Golden Guide, and read about minerals and their characteristics. Make your own chart of common minerals and their characteristics. In your chart, list various minerals down the first column. Then have separate columns with space to describe characteristics such as color, cleavage, fracture, luster, streak, hardness, etc. Make a mineral ID kit that will allow you to demonstrate familiarity with color, streak, luster, cleavage, fracture, hardness, etc. Such a kit might include a white tile plate to check streak and a nail, a penny, glass and other common items to determine hardness. With organized activities like these that lead to a tangible reward, it's my hope that you'll soon see kids learning while-as always-having fun! AFMS Rules for 2003 are complete and in the mail to the regional Federation supply chairs and rules chairs. They consist of 44 pages of revisions and new pages. The postage alone will cost more than any previous revisions. The complete AFMS Rules Book will be on the web page soon. To obtain either the 2003 updated pages or the complete Uniform Rules booklet contact your regional rules chairman. A brief summary of the rules changes can be found elsewhere in this issue. A new State property that will include several of Maine's most famous mineral localities, including the Dunton tourmaline mine, in a beautiful mountain setting! The Oxford Hills in western Maine are known throughout the world as a prolific source of gems such as tourmaline, amethyst, and aquamarine, as well as many rare mineral species. Thousands of people come to Maine every year to search for these minerals in the rock piles left behind from earlier mining operations. Historic mining for feldspar and gem tourmaline in the town of Newry opened up several deposits rich in uncommon minerals. These mines are located on a scenic mountaintop that also offers great opportunities for hiking, geologic studies, and other outdoor recreation. Many popular mineral collecting sites in Maine have been closed to the public in recent years due to encroaching development and other factors. But the State of Maine now has the opportunity to acquire a 100-acre tract of land in Newry that encompasses the famous Dunton tourmaline mine and six other neighboring quarries. The Maine Geological Survey (of the Department of Conservation) has launched a fund-raising drive to purchase the Newry mines for a permanent park whose principal use would be for recreational mineral collecting. Partners in this effort include the Maine Mineral Symposium Association, the Federation of Maine Mineral and Gem Clubs, and the Threshold to Maine Resource Conservation and Development Commission. All mineral hobbyists, earth science students, educators, and outdoor enthusiasts will benefit from the Newry Mineral Park. The Land for Maine's Future board has made a generous pledge toward the purchase price, but most of the funds to acquire the property must be raised from other sources. The Maine Geological Survey is committed to this effort, and we are asking mineral clubs and individuals to help by donating to the park acquisition fund. If you are a subscriber to the AFMS Newsletter this may be your last issue! Look at the label attached to page 1 of this issue. It shows the date that your subscription is over. If the date shown is "03", then your subscription will continue. If however, the date says "02" then this is your last issue. To continue to receive the AFMS Newsletter each month, send a renewal check to the AFMS Central Office at the address shown on the committee page of this website. If you are a club officer (President, Editor or Secretary) you will continue to receive the Newsletter as part of the AFMS services to your club. I'm pleased to announce the latest honorees in the AFMS Rockhound of the Year recognition program. Share your good fortune with the rest of us! Surely your club has at least one person or couple that you would like to brag about. Why don't you? Every AFMS affiliated club may nominate an individual or couple each year. Send your regional ACROY chairman the name of your nominee, name of your club and a brief (50 word) paragraph telling why this person is so valuable to your club. The Austin Gem and Mineral Society, of Round Rock, Texas has selected Susan Postlethwait as our Rockhound of the Year for 2002. Susan is a dynamic member that every club wants. She has demonstrated enthusiasm and leadership in many areas such as field trips and classes. Additionally she has transformed the meeting refreshment contribution to an activity of joyous participation. Always willing to serve, she is planning to use her leadership skills and enthusiasm to reinstate our youth program. We have no doubt that she will succeed. We are honored to have Susan as a member. The Central Texas Gem and Mineral Society of Abilene, Texas present Jerry Davis as their 2002 Rockhound of the Year. Jerry teaches silversmithing classes on two levels with seven sessions each and is a silversmithing teaching assistance at the clubhouse silver shop. He volunteers at the Cisco Folklife Festival demonstrating the silvershmithing art. He coordinates member's demonstrations at the community Festival. He is Chairman of the Demonstration tables at the Central Texas Gem and Mineral Society Show and volunteers in the lapidary arts. The Williamson County Gem and Mineral Society of Texas nominate two exceptional members. John and Marie Wald are presented as the clubs 2002 AFMS Club Rockhound of the Year. Both have served as officers of the club for several years. Currently Marie is treasurer and John is a Vice President and Program Chairman. They are always willing to do everything they can for the club. They are above all dependable. They get the job done and always there when we need them. James Powers is nominated by the Williamson County Gem and Mineral Society of Texas as their 2003 AFMS Club Rockhound of the year. James is quiet but always working to help the club. He has been a member for many years. It would be impossible to list all of his accomplishments but it is safe to say the success of the club has been large part due to his efforts. James enjoys sphere making and is accomplished in all aspects of lapidary arts. He shares his knowledge with other members and is always available when he is needed. James is a delightful person and wonderful member. DeRidder Gem and Mineral Society of Leesville, Louisiana has nominated Adam Valin as their Rockhound of the Year for 2003. He and his wife Gail have been members of our club for only a few years. Some people, when they join an organization take a while to get involved but not Adam, he dove right in and got his feet wet, first being active member and then serving as show chairman for our 2002 show. The show was a great success under Adams direction and leadership. He has been elected as our Treasurer for the come year and will be show chairman again in 2003. We are honored he chose to join our club. The Oak Cliff Gem & Mineral Society wishes to nominate Charles Gallion as its Rockhound of the Year. Charles, a twenty-two year member, has served as Shop Foreman, Instructor and Developer of Safety Precautions. He has planned lessons, given programs, served on committees and performed craft related tasks. Well liked and respected for his Gem Stone knowledge, we therefore recommend Charles for Rock Hound of the Year 2002. Spring River Gem & mineral Club nominates Ray Gottschalk for the AFMS Club Rockhound of the Year. A member of the club for 11 years, Ray has served as President or Vice-President for 8 of them. Ray did it all single-handedly: programs, field trips, silent auctions, librarian, cookie sheets and also arranged Picnic and Christmas Parties. He's the guy who left meetings and field trips last to make sure everyone's car started. It was his dedication and service, rockhounding enthusiasm and charismatic personality,, that carried the club. Without Ray's humor, persistence, and leadership, the club many not have survived and grown to be the vibrant organization it is. The Fort Collins Rockhounds proudly nominate Jim and Irene Kasal as AFMS Rockhounds of the Year. Club members for over 25 years, Jim has served as Chairman of our well-respected annual Rock and Gem Show-and Irene as its treasurer-for over a dozen years. Both positions require attention to many details throughout the year. Jim and Irene also make presentations to local schools and organize numerous other club events. By example, they demonstrate how a hobby can be turned into a community-wide, educational, social, and civic asset. and Gary Raham, Lodestone editor. Santa Cruz Mineral and Gem Society has chosen Felice "Fel" Di Geronimo as their Rockhound of the Year for 2002. Fel has been foreman of the SCM&GS lapidary workshop, keeping it open on Saturdays, and maintaining the equipment. He runs the drawings at monthly meetings and the silent auction at the annual picnic. At the holiday dinner, he conducts a sing-a-long and accompanies on his mandolin. At the annual show, he welcomes visitors giving small minerals to children and copies of mineral magazines. Fel and his wife Lee raise money for seniors by running in the "Human Race". Fel says he's 86 but he hardly seems like a "Senior". The Amador County Gem and Mineral Society nominates Marilyn Cummins as their 2002 Rockhound of the Year. Marilyn is a charter member and has held nearly every position including President, Vice President, Recording Secretary, Corresponding Secretary, Treasurer, Director-at-large, Scholarship Chair, County Fair Committee, Hostess, Telephone Committee and Publicity. She attended CFMS meetings as alternate Director, and served as Historian/Librarian for 14 years. She was Editor/Publisher for 23 years and was inducted into the CFMS Editors' Hall of Fame. Marilyn has spent many hours working on behalf of the club. She was a driving force when the club put on "Gold Dust Days", she gave demonstrations and placed displays in local schools and has worked for club's booth each year at the "Pow Wow". The Contra Costa Mineral & Gem Society would like to honor Robert Pevahous and as their Rockhound of the Year for 2002. Bob joined our club in 1973 and has served as Field Trip Chair, Show Chair, (2 years) and club President. He served as Federation Director for 15 years and has attended all the Federation Shows. He has demonstrated lapidary at many shows. He is known for his delicious Jams and Jellies which he donates to silent auctions and other money raising functions. As one of our honorary members, he continues to be an active and knowledgeable member of our club. The Carmichael Gem & Mineral Club would like to honor one of their founding members, Bob Hamilton. Bob is one of those "ambassadors of rockhounds" that every club should have. He is the first one to welcome guests show them around and greet them each subsequent month. Bob is a consummate collector of all sorts of things and is always ready to share his knowledge and experience. Fossils For Fun would like to nominate Hugh and Florence Brady as their Rockhouds of the Year. Hugh and Florence are fairly new members but they jumped in almost immediately to become involved in our club. Florence served as Secretary for two years and Hugh is very involved with field trips. Both Hugh and Florence help with hosting our meetings and are always ready to help; whatever the task. The El Dorado County Mineral & Gem Society would like to recognize Ed Grosch. Since 1973, Ed has contributed his time to our club. He was rockman for 3-4 years and has held all the club offices. He has helped with hosting the County Fair and our Gem Shows. He is most appreciated by the children of our community for the time he has spent going to classrooms with rock samples and leading field trips. The Whittier Gem and Mineral Society names Vern Cliffe as their 2002 nominee. Vern was a great help to the club this year when it was necessary to move to a new site. Vern has been the Dealer Chairman for the annual club show for many years and does everything he can to make our shows great, including holding work parties at his house. Vern has had nearly a perfect attendance record at field trips for a number of years and is always a great help to the field trip chairman. Vern contributes his ideas at meetings on many topics important to the club. Shoshone Rock Club is pleased to honor club members Jane and Lynn Neale as our Rockhounds of the Year for 2002. Both have been members of the Shoshone Rock Club since 1970 and both have served in various offices including President and Vice President, Secretary, Treasurer, Field Trip Chairmen and Board members, etc. Jane, as our current President, and Lynn as our Field Trip organizer, legislative committee member and lapidary instructor, are a couple who are always doling more than is asked of them. They both make old and new members feel welcome at meetings and have even extended that welcome to include visiting their home for further workshop classes. They have made a large contribution in bringing in new members this year. Both are talented in the lapidary field, Jane as a skilled silversmith and Lynn doing a terrific job making cabochons. The club is fortunate to have them as members. We appreciate the opportunity to honor these outstanding members of our club. The Golden Spike Gem and Mineral Society of Ogden, Utah have chosen Carroll Crittenden as our AFMS Club Rockhound of the year for 2003. Because of special circumstances, it was necessary to honor Carroll at our November meeting because he and wife Alice were leaving for an LDS mission. Carroll was a charter member of Golden Spike when he joined the club in 1948. He was a high school student when shop teacher, Jean Case, encouraged his students to join the rock club to learn about rocks, lapidary and silversmithing. Carroll joined to get a good grade and the experience turn him into one of most dedicated members. He piled up a long list of assignments that have improved our club for its members. He has served as President, Field Trip Leader, Board Member, Pauli Stew Chairman (a fall get-together to socialize before winter), and lapidary teacher at our local Senior Center. At show time, he is involved in set up and tear down and arranges demonstrators for all three days of the show. He is always willing to lend a hand any where the club needs him. SCRIMSHAW - Division H was proposed and passed by the committee. GEM TREES - Division A, Open was passed, but there will be a change made to the scoring of this new proposal at the next meeting in Ventura, June 3, 2003. JEWELRY - Modification to Division D, this has to do with the variety of work and the scoring for the more difficult techniques. FOSSILS - Modification to Division F, there has been a change in units - setting up one group for classification and one group for locality, time or rock unit. Proposal to form a committee of judges to arbitrate controversies arising during judging of competitive exhibits at the AFMS Show. This was worked out and passed. Correction made to the AFMS Rules Book on CF-4. CF-4 was removed from the out of class section. DIATOMITE was added to the AFMS Lapidary List. TUMBLED STONES OUT OF CLASS in Division C & G. Tumbled stones will be out of class with the exception of C A 4 and C A 9 Carving Diorama. It's hard to believe that we are into the year 2003 already! The AFMS/CFMS show, Seaside GEMboree is just around the corner. Now is the time to start planning your vacation for June 2003 and attending the HUGE convention and gem show in Ventura, California. The Seaside GEMboree will have something for the whole family. Our camping is right next to the Ventura Beach. Our weather will be cool with sunny afternoons. Seaside Park (formerly Ventura Fairgrounds) is within walking distance of the beach city of Ventura and all of its local shopping. The AFMS/CFMS show will have 50 dealers, demonstrations, gold panning, displays, a silent auction and many SPECIAL DISPLAYS NEVER SEEN BEFORE. One of our special programs will be by Bob Varish, a meteorologist who has self-collected two of the MARS METEORITES. Bring your possible meteorites to our show and Bob will tell you if you have a Meteorite or a Meteowrong. We will also have a FULL SIZE TRICERATOPS MODEL, collected by Paleontologist Marcus Erickson, who will be on hand to talk Dinosaurs and help in our Dino Dig. We will have a HUGE BUILDING for display cases, where we will have both AFMS and CFMS competitive displays and also non-competitive displays. This will give you a great opportunity to show your best skills and material. We hope you will all want to put in a display case. Our MERMAID CONTEST is creating a lot of interest. We want everyone to start creating an entry. Your entries will be displayed together in a display case. There will be a nice prize for the winning entry. To date we know we will have carvings, silver work and jewelry made for our Mermaid Contest. HOW ABOUT YOU? What will your entry be? Get your entry form in as soon as possible. All of the Seaside GEMboree forms; Preregistration and Camping, Mermaid Contest, Display, etc. are on the CFMS WEBSITE (<www.cfmsinc.org>). You can print the forms from the website or call Maxine Dearborn at 818 883-7851. At next June's Seaside Gemboree you'll have a once in a lifetime opportunity to see lightning up close and beautiful. When lightning reaches down and fingers the Earth, sometimes it forms fulgurite. Fulgurite is a rare rock find; it only occurs where lightning strikes silica-rich sand or soil. It is believed the intense heat of the lightning fuses the silica creating a natural glass. Delicate fused-silica tubes branch out as the lightning ripples through the soil. Frequently describe as having a tree-root appearance and shape, fulgurites usually have a rough exterior with a smooth glassy interior. Color is effected by the impurities in the available silica. Typically, these rare formations are measured in inches. The Lone Pine Gem and Mineral Society of Lone Pine, California has found an incredible fulgurite specimen that measures over 5 feet in length and is believed to weigh over 70 lbs. They have built a special case so they can display this amazing wonder at the Seaside Gemboree, June 5-8 in Ventura. This is your chance to see lightning frozen in time. The Del Air Rockhounds are searching high and low to bring the new and the wonderful to the AFMS/CFMS Seaside Gemboree. If you or your club has an amazing find that you would like to display please contact Display Chairperson, Keri Dearborn at GemboreeDisplay@aol.com or (818) 883-5253. Always recognizing the importance of good club newsletters, Barbara served as AFMS Club Publications Chair for several years before "going through the chairs" of the AFMS officers ladder. (At the time this occurred, officers served for six years, moving each year to a different office until finally becoming president at the end of the sixth year or step of the "ladder".) In her capacity as Club Publications Chair she wrote many articles for the AFMS Newsletter and chaired several AFMS Editors' breakfasts with June Culp Zeitner. During her term as AFMS President the Operating Procedures and Bylaws were rewritten and updated. The AFMS Endowment Fund was also established so that additional educational projects could eventually be undertaken by the Federation. Eventually Barbara and her first husband Obie moved to Florida where they planned to retire. Later Barbara remarried and eventually moved to the Carolinas. After her second husband passed away, Barbara moved to Las Vegas to be near her sister. Her interest in the hobby and Federations continued and many a committee chair would receive notes from her filled with comments and suggestions. Barbara served both the CFMS and finally the ultimate position as AFMS President with dignity, good humor and love of her fellow rockhounds.... we will miss you Barbara. American Federation Bulletin Contest Guidelines, Item #7, states: "Reports" should not be entered in AFMS competition as an original article, although they are a vital part of the bulletin. Reports that are most likely to be entered as an original article are field trips or vacations. It is a report if it is primarily a travelog. It could be an original article for competition if the author writes about geological factors of the area, gives good description of materials found, and/or uses research to enhance the educational value of the report. End quote. Each Regional Federation has similar guidelines. And all federations stipulate that the JUDGE makes final determination as to whether an entry is a report or an article. Dictionaries define a REPORT as: an account or statement, usually detailed, presented in formal or organized form; a written record or summary of the proceedings of a meeting or session. An ARTICLE is defined as: a nonfictional prose composition that is an independent part of a publication. So, we have an 'account' as opposed to a 'composition'. To ME, a REPORT could have been written by ANYONE who attended the event or read the book. An ARTICLE has a personal touch, and could ONLY be written by the specific author. That 'personal touch' in a technical article can be due to the references used, or the interpretation of the research. It's kind of like the difference between an autobiography and a memoir. Writer's Digest magazine (February 1999) had comments by various authors on the memoir versus the autobiography. Frank McCourt wrote "Please understand that ANGELA'S ASHES is a memoir. It is not an autobiography. The difference? An autobiography is an attempt at a factual reconstruction of events. A memoir is an impression of events, the gist of conversation, if not the precise language." In other words, it's HIS STORY, not HISTORY. An ARTICLE, then, is YOUR view, YOUR impression, YOUR take on the experience or event or facts. Items listed as Club News on the Bulletin Score Sheets are generally reports. ARTICLES are special-interest or in-depth features. Of course the article MUST be original. Being original is hard when dealing with facts such as physical properties of minerals. An author should try to find some lesser-known or unusual facts. Here is where the research and references come in. However, you must NOT sacrifice accuracy for originality. Stating that quartz has a hardness of 13 may be original, but it will sure lose points for accuracy. TV's C-SPAN2 broadcast a panel discussion on Science Writing in April 1999. One question from the moderator was: How much can you assume the reader knows? How explanatory do you have to be? Panelists' responses, included: "Anyone can understand if you explain it. Figure out what they need to know. They do need the vocabulary." "You CAN write non-technically and be just as exact." "Sneak the information or education into your story." This all relates to what I look for in an article, especially an Advanced Article. The AFMS, and some of the Regional Federations, has an Adult Articles Advanced class. "Advanced" is the status of the AUTHOR. This includes previous First Place Article winners, published writers, people who work in an earth science field -- teachers. geologists, museum personnel, gem & mineral dealers, and so on. The Advanced Articles do NOT have to be long, dry, scholarly treatises. A good Advanced Article -- or any article, for that matter -- takes a familiar subject and sheds new light on it. It may use a different or unusual approach to the subject. A good Advanced Article takes a complex topic and makes it easy to understand. A good Advanced Article can be deceptively 'simple', but after reading it, you realize you learned something. Now don't get me wrong. I like in-depth, technical articles, the Mineralogical Record type of article, too. I like ANY kind of well-written article on ANY area of the earth sciences. I love judging articles, because I learn so much, as I read, and re-read them, and verify the accuracy of the information. As the Editor, YOU know what kind of article will interest YOUR members, what will appeal to them, what will be of the most benefit. These are the guidelines you use when selecting articles to copy from exchange bulletins. A REPORT is -- Just the facts, Ma'am. An ARTICLE is -- The rest of the story. Kitty Starbuck is a pack rat! Just ask AFMS President-elect and husband Marve. Kitty has been editing newsletters since the 1960's and has saved all the exchange bulletins she's received. Recently she spent time going through some of these and has found a treasure trove of good and useful material in the form of puzzles and brain teasers which would make wonderful "fillers" for club newsletters. Recognizing their value, Kitty has assembled them in booklet form...and she's even included the answers for those in need of a bit of help. You can order one of these booklets for $4.00 each (including postage). Just send a check, payable to "Midwest Federation", to Eric Peterson, MWF Supplies Chair, 18814 L Drive S; Marshall, MI 49068. Don't forget to include your name and address with your order!